David Carr writes in the New York Times that he was recently invited to Google's headquarters - the Googleplex - in California. But it struck him: he already lives in the Googleplex. So many of the tools he uses every day, all day are Google supplied. He's right - and it's true of most of us. I came across his article using Google Reader, and I'm writing this piece using Google Blogger. Carr quotes a blogger as observing that “Google has created an ecosystem that perpetuates itself by being useful.” Where will it stop? 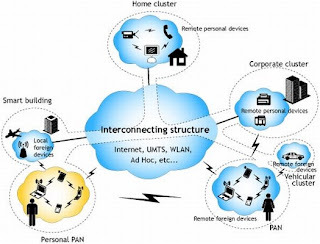 According to Dan Gould we're heading into a future of personal area networks (PANs) - as illustrated in the diagram - with a thousand things networked (from our office to our car to our fridge to our TV) to meet our individual needs. Our very own private Googleplex. This has a lot of people worried. The National Intelligence Council has even described The Internet of Things (pdf) as one of six potentially Disruptive Technologies out to 2025. They're right of course: we have simply no idea how far these technologies will go in changing our lives. But I'm alright living on Planet Google for now. The essence of the future that I see unfolding is fundamentally de-centralised, personalised and egalitarian.